A breathtaking journey around the world, crossing oceans and mountains… You decided to go! Oh my, The Netherlands. One country of its kind. Learn about their relaxing laid-back lifestyle in Part I and set off to discover the North-Western European country here! Can you see the stars above Amsterdam, hear the song my heart is beating to? 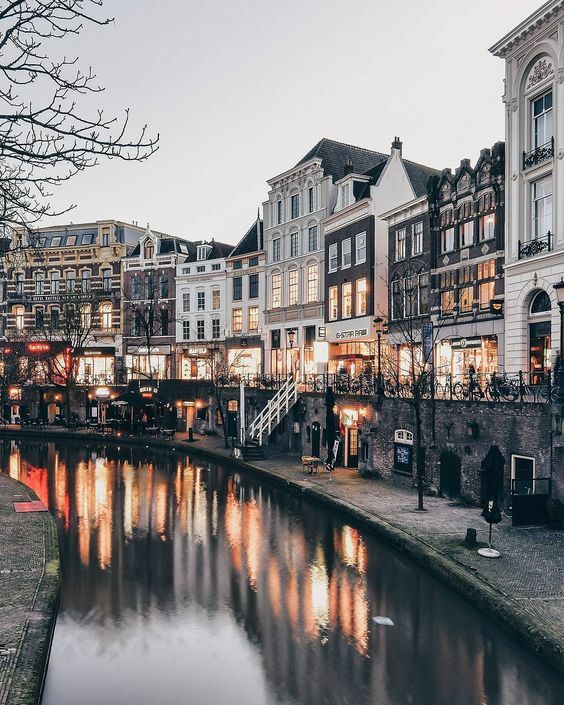 When you travel to the city of canals, you will definitely be able to relate to Ed Sheeran’s song. Frankly, Amsterdam is one of my favourite cities. it just has an undeniable magic which casts a spell on you. Even though I was only there for 22 hours, it took me in (spontaneous road trip, not my fault 🙂 ). The city is quite walkable. To get the most out of your stay in A’dam, walk through the city during the day all the way down to Vondelpark near the Rijksmuseum. Should you plan to visit one of the stunning art museum such as the Van Gogh museum, do book the tickets days ahead and calculate 2 – 3 hours for one tour. Be brave and get lost in the back roads as well, then you will get a glimpse into the everyday life of the locals as this is where they mostly stay due to the flow of tourists, especially in the summer months. Yet, the authentic A’dam experience only comes with a night-ride on the Grachten when they are beautifully illuminated and the river does not only reflect the light, but also the life. The Hague is the centre of European Justice, the EU has their court situated there and they also host a United Nations institution. Frankly, the city does consist of mainly the political institutions and sites. There is also a financial district. Yet, The Hague is home to many music festivals. Should you be able to spend April 27th there, take the chance – this day is ‘Koningsdag’ (= King’s Day) and a national holiday. The city is full of fairs and flea markets which you can attend to. Utrecht is quaint and quirky, and it is hard to resist the city. It has once been the religious heart of the Netherlands. And, as the Dutch are amazing at combining old with new, the city is now a modern university city with medieval sites on every other corner. Many historic mansions have been turned into boutique hotels and the urban style of the cafés, restaurants, clubs etc. draw all kinds of people to Utrecht. Many vibrant concerts also take place here. Delft is between The Hague and Rotterdam. It makes the perfect day trip with some interesting sights such as the Museum het Prinsenhof, which was once a monetary and now hosts paintings of the Dutch Golden Age. A trademark blue and white pottery which is typical for the country is also accessible here. Rotterdam is 78km, 40 min by train, from Amsterdam and often seen as its little sister.Innovation is more or less its mantra since it was largely destroyed in bombings of WWII. In contrast to Dresden, they did not want to reconstruct the city it has once been, but build a modern metropolis. WIth success. Rotterdam’s port is one of the mots important ports in all of Europe, therefore the city has an urban touch to it as well. A great tip for Rotterdam is enjoying the Cafe Culture by catching up with some friends or working in the authentic coffee rosteries. Man Met Brill is one of the most famous ones. Many people sea-k the seaside (okay sorry, this pun had to be) 🙂 Also a lot of Germans travel to the Netherlands for a weekend getaway. Zeeland is a great place to escape to with a perfect combination of cute beaches, little towns and local cuisine. The islands in the North Sea are especially attractive to the upper middle-class. What The Hell Was 2018? Not sure whether or not you should travel/ explore another country/leave your comfort zone/ just live life to its fullest by seeing the world? My blog will show you lots of different aspects of traveling and give you a lot of countries to visit:) It will show you why I decided to go and why you should, too!